Oxford Film Festival Take 5 With...: Two weeks from tomorrow! Get Excited! Two weeks from tomorrow! Get Excited! 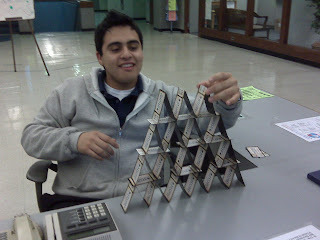 Moises Ortiz makes a lovely pyramid out of a stack of film festival magnets at the Turner Center on campus, but I hope he'll remember to share them with passersby. Posters are going up around town, merchandise is arriving, filmmakers are RSVPing, everything is falling into place. But there is STILL TIME for you to get involved! Sign up to volunteer, if you are so inclined. Volunteers get perks -- not a pyramid of magnets, but we'll make it worth your time.